Catch a glimpse into Charleston’s burgeoning farm-to-table food scene on this 2.5-hour culinary and historical tour. Shop at the Charleston Farmers Market alongside a chef, who will create a 5-course brunch out of the ingredients you purchase while you take a 45-minute guided walking tour of the city. Conclude your tour at a restaurant, where you will share the chef’s meal with your group of 16 people or fewer. 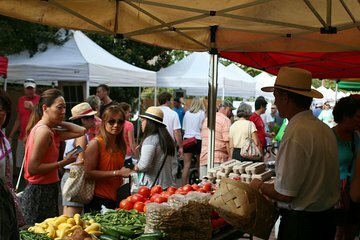 Meet your guide and a featured chef at the corner of Meeting and John Streets near the Charleston Visitor Center at 9:30 a.m. Head to the Charleston Farmers Market at Marion Square to pick out fresh ingredients alongside your chef and see where the locals hang out on Saturday mornings. Then, take a 45-minute walking tour of downtown with your guide, who will share history and legends of Charleston’s famous historic quarter along the way. Meanwhile, the chef will prepare a multi-course meal with the ingredients from the market. After the walking tour, rejoin your chef at a downtown restaurant and enjoy your 5-course farm-to-table brunch. Complete your meal at noon within easy walking distance of Charleston’s shopping and historic attractions. Please note: This tour is only available on Saturdays between mid-April and mid-December. This tour was absolutely well worth the money. We got to visit Charleston’s amazing farmers market and pick out fresh product for our fabulous brunch prepared by Chef Nick. Chef Nick’s skill level was one of a real culinary- one of the most unique experiences I’ve had! Highly recommend. Wonderful experience. Hoon Calhoun was an excellent guide through the farmers market and to the restaurant, with colorful stories about the history of Charleston and why it's such a culinary town. Then Chef Ross from R Kitchen astounded us with a delectable display of creativity based on the food we had selected at the farmer's market. It has been the highlight of our visit to this charming city! This was by far the best activity/tour that I did with my parents in Charleston! Our host Hoon Calhoun was welcoming and entertaining it was fascinating to learn the low country food history and town history of Charleston interwoven together by Hoon. Our tour began with a short walk from the visitor's center to the farmer's market located at Marion Square. It was just so exciting to see all the fresh local produce and products! After everyone in our group got to pick one produce from the market to give to our chef, we had about 40 to 45 minutes to spend on our own at the farmer's market. It was so much fun to go from vendor to vendor to sample their products and ask questions directly from them. And it was hard not to buy anything and take it home with you! Afterwards, our group walked to Virginia's on King where we our chef prepared our 5-course brunch. Through the brunch, Hoon continued to share the local food history and shared some of his family's food stories as well. The chef did an impressive job incorporating all our group's pickings from the market...and we couldn't get enough! All in all, if you want to be introduced to Charleston, do it through a food tour! So glad we included this on our recent visit to Charleston. Great value for money too! Wonderful to experience the Farmer Market with Mr. Henry 'Hoon' Calhoun, a truly charming and amusing southern gentleman. He has humorous tales and facts to share. You are then treated to the creative culinary skills of Chef Chris at the Kingdom restaurant. A really delightful experience. This was one of the best tours we have ever experienced. Great concept, excellent food and an experience we will never forget. We met exceptional people and enjoyed great food and drink and listened to some great stories by Hoon Calhoun. We met a couple and explored Charleston with them.